The Feelies at 9:30 Club in Washington, D.C., June 22, 2018. Back from a long weekend in Washington D.C., where last Friday night I got to see The Feelies perform at the 9:30 Club. The venue been located a couple places around town since opening in 1980. The current location feels as if someone took Sokol Auditorium and sliced it in half, added a great stage and sound system as well as a kitchen and numerous bars, which I guess makes it nothing like Sokol Auditorium. It’s sort of like an old, lived-in high school gymnasium with a balcony that circles outward from either side of the stage. A small room in back is filled with CDs from every band that’s performed at the club — thousands and thousands lined up in floor-to-ceiling book cases. The show was “An evening with The Feelies” which meant no opening act. The band went on around 9:30, sounding exactly like the band I’ve been listening to for ages. Frontman Glenn Mercer sounds no different than he did on albums that came out 30 years ago, a low mumbling voice that’s more spoken murmur than singing. Alongside him guitarist Bill Million and bass player Brenda Sauter were on point. But what really fueled the performance was drummer Stan Demeski and percussionist Dave Weckerman looking like a couple accountants on leave pounding out the crazy rhythms. 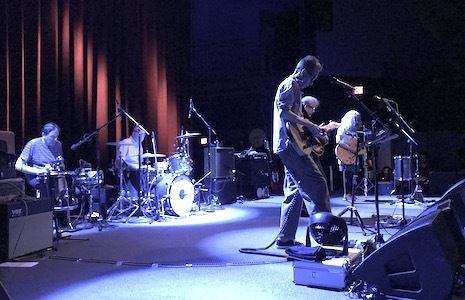 Anyone even vaguely familiar with The Feelies knows that their music is sort of a formula — a simple chopping guitar riff, followed by another, followed by crisp, tasty backbeat drums and rhythms. It’s a style that’s unmistakable and that’s influenced an array of bands from R.E.M to Luna to The New Year. The first set was dedicated to newer stuff — or at least stuff I wasn’t familiar with that sounded like all their other stuff. The second set was dedicated to the “hits” — tunes off my favorite albums, the crowd erupting with every opening rhythm and chord. For the uninitiated, the songs can all sound very similar, but to those who’ve followed them for years, the favorites stand out. I realized while watching the show that chances that this band will ever come to Omaha is nearly zero, and that the only way I’d ever have gotten to see them was to travel. The fact that the show was happening while I happened to be in D.C. was a stroke of luck, but now I’m starting to get the itch to go to other towns to see bands I know will never come here. Where will I go next? 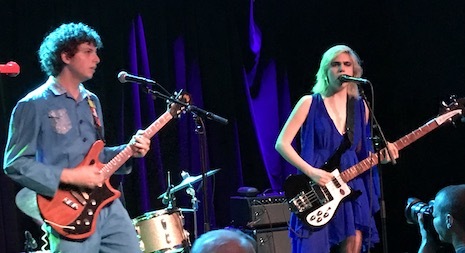 Sunflower Bean at Reverb Lounge, June 25, 2018. A crowd of less than 50 showed up at Reverb last night for Sunflower Bean. 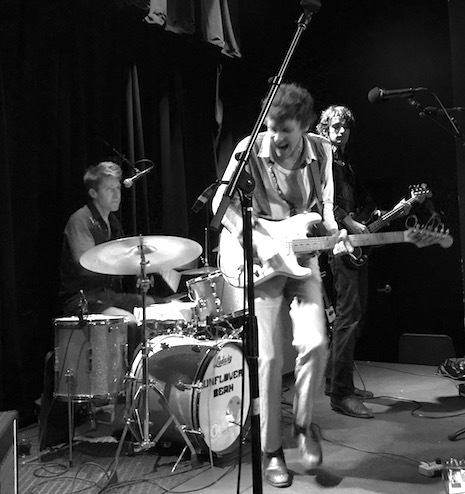 The band is riding high on an Sirius XMU hit, the easy-listening indie rocker “I Was a Fool” on heavy rotation and, as I mentioned the other day, sounds like a track from The Sundays. Frontwoman Julia Cummings’ voice comes in two flavors — a sweet, clear coo a la Harriet Wheeler (of the Sundays) and a pronounced Joan Jett snarl which I wasn’t ready for. Cummings rolled out her Jett growl throughout the set, mostly on songs from their new album, Twentytwo in Blue, which is a more straight-forward pop record than their debut, 2016’s Human Ceremony. The debut is darker and fueled by a post-punk shoe-gaze sound. Whenever the band lit into one of the earlier tracks, like standouts “2013” and “Easier Said,” they shifted into a blue-toned gear. Kudos to Nick Kivlen’s clever guitar solos throughout the set. Cummings tried about as hard as any performer I’ve ever seen (outside of a cover band) to get the crowd into the spirit, coaxing call-and-response fist-shake audience choruses, leading overhead hand-claps, and pleading (a number of times) for people to please come closer to the stage. Just another Monday night in Omaha. Sunflower Bean is a band in transition. I liked where they were headed on their first album; but was less enthusiastic about the pop rock of their sophomore effort. The division between couldn’t be more stark. Where they end up on their third record could make all the difference. Public Access T.V. at Reverb Lounge, June 25, 2018. Last night’s opener, Public Access T.V., was a fun-loving indie-pop trio that reminded me of early Strokes or The Fratellis. Fun, young and fashionable, I could see them catching fire with the kids. Tonight it’s the return of Cold War Kids, this time to The Waiting Room. The band has a new album called Audience (Live) recorded on stage in Athens. Thomas Abban opens. This one is SOLD OUT and starts at 8 p.m.